SAN MATEO, Calif., [DATE OF RELEASE: 12/06/2018] — The Construction Industry has, somewhat miraculously, managed to avoid the digital world the rest of us live in. And this is despite the fact that even the ancient Romans foresaw an Industry in which projects would never be completed on time or within budget unless specific care were taken to ensure otherwise. Fast forward 2,000 years and those same concerns are still prevalent in the Construction Industry, which accounts for 10% of U.S. GDP yet records just a 1% growth rate annually. Compare that to the 3.6% annual growth of another major industry, Manufacturing, which has adopted modern technologies and tools to improve productivity. However, all of this is about to change for the Construction Industry thanks to the sophisticated yet straightforward automation tools offered by Veryfi. Since graduating from YCombinator in 2017, Veryfi has been building out a mobile automation platform for field teams. This platform digitizes and automates day-to-day functions like data entry, timekeeping, communication, and reporting so teams can do their jobs more efficiently and more effectively. “We’re excited to partner with Sonim to empower the hardworking Construction workforce with smarter digital tools,” says Ernest Semerda, co-founder of Veryfi. “As the industry leader in mobile solutions for the ‘people who serve us,’ we are thrilled to offer such a valuable tool to our clients that will make these essential workers’ jobs just a little bit easier.” says Sonim CEO Bob Plaschke. Contact Veryfi to find out more about this exciting new development, and visit www.veryfi.com/sonim for more information. Veryfi, Inc. is a California-based mobile software automation company founded in December 2016 and backed by Y Combinator and other prominent investors in Silicon Valley and beyond. Veryfi provides Architecture, Engineering & Construction (AEC) workforce companies of all sizes access to smart mobile tools that eliminate 90% of time wasted doing rote tasks like data entry (and chasing down records) while improving job costing and empowering financial prosperity. Sonim Technologies is the only U.S. manufacturer of mission-critical smartphone-based solutions designed specifically for workers in extreme, hazardous, and isolated environments. 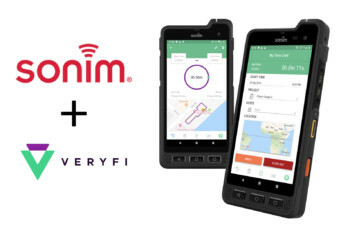 The Sonim Solution includes ultra-rugged mobile phones, business-process applications, and a suite of industrial-grade accessories — collectively designed to increase worker productivity, accountability, and safety on the job site.